I think I'll always be a chunky cocktail ring kinda gal at heart, but lately I've been obsessing over stackable rings. I love the whole mix-and-match concept, the delicate designs, and the fact that I can wear as many - or as little - as I want at any given time. Here are some of the stackables I'm particularly loving right now (and where to get them). 1. Diamond Seed Stacking Rings, Blanca Monros Gomez, $160. 2. Ariella Collection Stacking Rings, Nordstrom, $68. 3. Silver, Gold & Gemstone Stack Rings, B and G Jewerly, $25. 4. Samma Cutout Stackable Rings, Maryam Nassir Zadeh, $58. 5. Juicy Couture Semi Precious Stack Rings, Piperlime, $88. 6. Karma Mixed Metal Stack Rings, Dogeared , $58*. 7. Silver and Bronze Feather and Zircon Rings, Iosselliani, $248. 8. Stacked Bronze-Toned Rhinestone Rings, Urban Outfitters, $18. 9. Crystal Stacking Rings, Target, $20. Happy Monday friends! I hope your week is absolutely wonderful in every way. I'm in a ridiculously good mood (especially for it being Monday and all), because Robbie finally got home from summer tour yesterday! And I have him home for an entire month! And yes, this is worthy of all sorts of exclamation points! Want to win this gorgeous dress from Shabby Apple ? 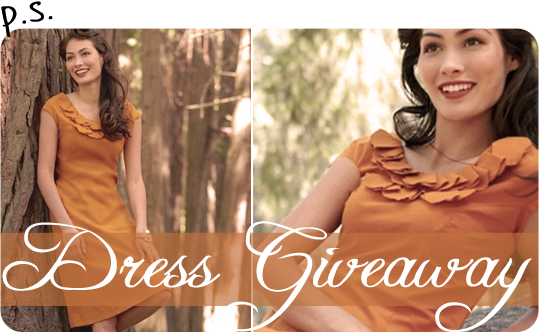 Just click here or the image above and leave a comment to enter our dress GIVEAWAY! Hope you're having a great day with Robbie... home for a whole month?! I'm so happy for you! Just wish I had pretty, non-wrinkled hands to show 'em off! Beautiful stackable rings! I love bold jewelry! Happy Monday! gah, i really love stackable rings! i need to just invest in some already! they're all so pretty! I'll admit, I rarely wear jewelry anymore. when i do, its usually a simple necklace. Thanks for the comments you guys! I am on a stackable ring frenzy right now. I've even started to put together little collections of skinny rings I have to create stacking ones. Love those stackers. Love the third ones, they look beautiful! I've never tried stackable rings, but I love the femininity of the first set. #3 is my favorite! I am a chunky girl too! Wow! Great picks! I'm obsessed w/ stacking rings.